Coconut Burfi/ Nariyal Barfi is a delicious, mouthwatering traditional Indian Sweet. This is my granny's recipe. She used to prepare lots of sweet dishes for every festive season all alone and never used to complain. She does that even now but age is catching up. 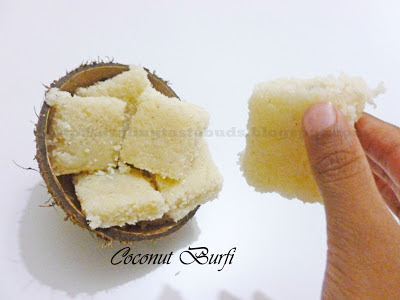 Every Diwali( Deepavali), she used to prepare this coconut burfi and we used to enjoy. I always wanted to prepare this all by myself one day and that happened to be yesterday when I had some already cut coconut's from temples. I called here up and grabbed the recipe from her. Never thought of hardwork she puts into making delicious sweets or any dishes for us. While preparing this, just realised how much patience you need when doing this. Just when I reached the last stage, there were so much of interruption - right from my naughty son's demands, my cell phone ringing, somebody at the door...UFF! Some how managed to finish off and was very happy with the result. Thank you Aayi for your signature dish. Oops! Sorry! there are still lots of recipes from her coming up. So keep watching this space. 2. Coarse grind it with some milk. Don't add too much milk. Add 1 cup or little more for 2 cups of grated coconut. 3. Now measure the coarse grinded coconut mixture and add in same amount of sugar in wok and start stirring till the mixture thickens and gets into a single lump. 4. Shift this to the greased plate and allow it to cool for a minute. 5. Cut it into desired shape and allow it to cool completely. Remove it and serve. Even though you use a greased tray, still you will have to work to scrap neatly and carefully from bottom. 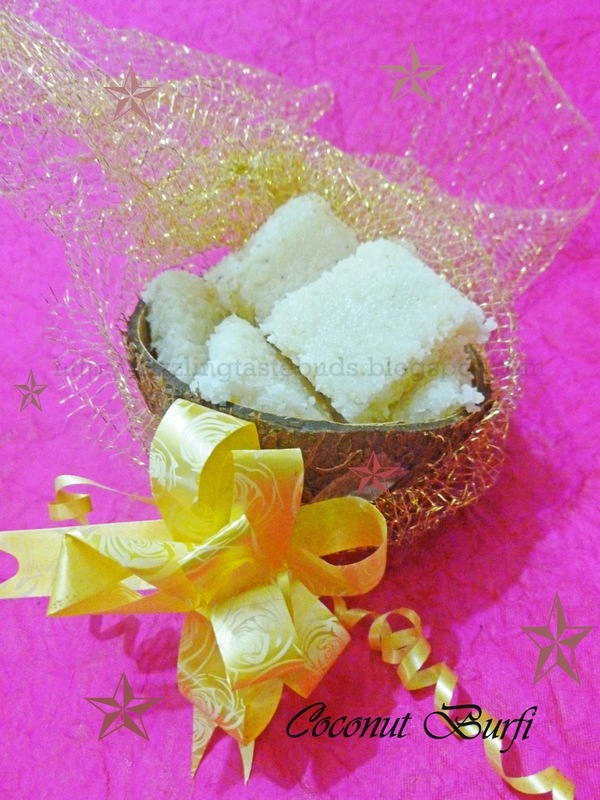 Enjoy this crisp delicious coconut barfi. looks soft and delicious and thank you so much for linking it to the christmas event. 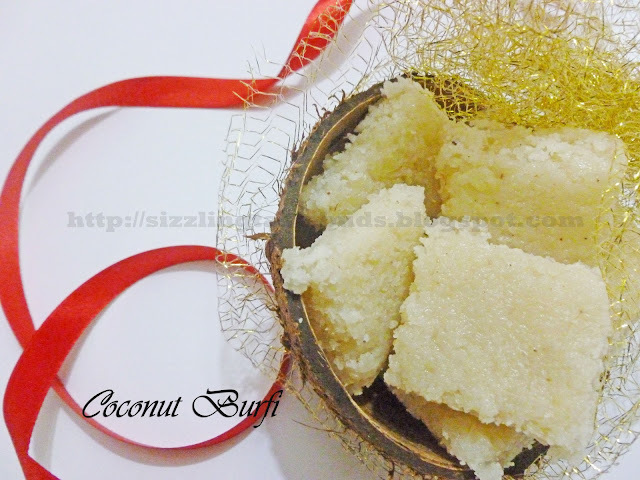 Yummy coconut barfi, one of the most traditional sweet dish of India.